Transcription is a key regulatory step for a specific set of gene expression, which in turn globally programs or reprograms the cells in response to a variety of physiological or stress signals. In eukaryote cells, transcription factors as well as cofactors are centered on the specific enhancer regions of genes to form high-order regulatory assemblies. Themost, if not all, of these cofactors are histone modification enzymes that convey a variety of upstream signals to epigenetic marks. Our lab is taking a structural and functional approach to unravel molecular mechanisms of the epigenetic modifications and transcriptional regulation, in particular the histone acetylation by p300/CBP and PCAF/GCN5. In prokaryotic cells, two-componentsystem (TCS), which typically consists of a histidine kinase (SK) and a cognate response regulator (RR), is a major signal transduction pathway responsible for stimuli induced reprogramming process. Our lab uses an essential TCS, VicRK, alsocalled YycFG or WalRK, in many gram+ bacteria as a model system tounderstand how the intra/extracellular signals regulate the transcription of bacteria. Epigenetic modifications deliver crucial information beyond genetic DNA. Their compositions, locations, dynamics and crosstalks are hypothesized in so-called ‘histonecodes’, which are complicated, sometimes very subtle and therefore challenging to study. While decoding is still in progress, we dedicate our efforts mainly on the regulation of acetylation and its crosstalk with histone methylation. Modification enzymes of p300, CBP, PCAF and GCN5 are responsible for lysine acetylation while HDACs remove them. 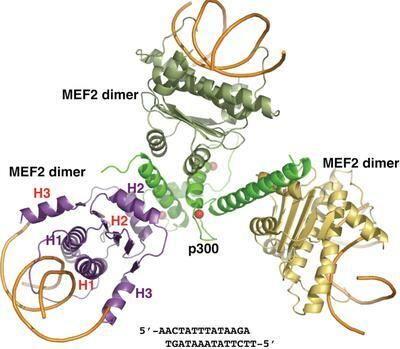 Their activities are always associated with specific transcription factors, for example, myocyte enhancer factor 2 (MEF2) by forming high-order functional complexes. We have made our greatest effort to build a series of architectural pictures for those cofactors sitting on DNA that may reflect dynamic processesof molecular machineries in transcriptional regulation (Figure 1). We are also interested in those underlying molecular mechanisms that regulate these assemblies and their enzymatic activities. Figure 1. A beautiful structureof p300 Cysteine-Histidine 3 (CH3) domain and MEF2/DNA complex, revealing threeasymmetric interfaces for high-order transcriptional enhancer assembly. Bacteria respond totransient environments via transmembrane-integrated sensor kinases (SK), whichact in concert with their intracellular cognate response regulators (RR) toelicit necessary adaptive responses that are critical for their survival andvirulence. The SK and RR are formulated into a concept of two-component signaltransduction systems (TCS), whereby upon detecting specific stimuli the SKautophosphorylates at a conserved histidine residue to initiate a signalingcascade of stress responses. Over 60% RRs serve transcriptional factors thatare activated upon aspartic acid phosphorylation by their cognate SKs. However,How the bacterial sensors perceive intracellular and environmental signals andfurther trigger autokinase activity is not well understood. 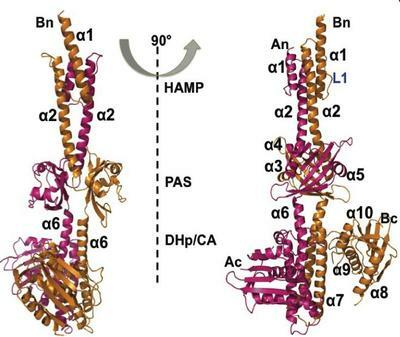 We have determinedan entire intracellular region of a histidine kinase VicK by X-raycrystallography, a landmark progress in our exploration of signal sensing andtransduction (Figure 2). We are currently taking a combinatorial approach,including computational simulation and genome editing, to investigateconformational dynamics, signal transduction and cellular reprogramming of ahistidine kinase using VicK and its cognate response regulator VicR asexamples. Since this TCS is essential in many notorious pathogens, including Streptococci, Staphylococci and Enterococci, which have developed multiple antibioticresistances, VicKR system can be considered a potential drug target for newantibiotics. Figure 2. A dimeric structure ofan essential histidine kinase VicK from streptococci,providing a molecular base to better understand stress signal sensing andtransduction in bacteria.